Significance : Finest example of Indian rock-cut architecture, especially Badami Chalukya Architecture. With large amount of searches for historical places in the state, Karnataka is a fast growing popular tourist state among both foreign and domestic tourists. The Badami Cave temples also made its presence felt on the search charts, attracting huge traffic although less popular than other historical destinations. These are the finest rock cut monuments in Karnataka. The cave temples are a complex of temples located at Badami, a town in the Bagalkot District in the north part of Karnataka. Badami Cave temples, comprising five caves on a hill cliff is 510 km from Bangalore and 113 km from Bijapur. There is also the natural beauty of the Malaprabha River Valley, in which the temples are set. The place was known as 'Vathapi' and is marked by a number of sacred and historic monuments. According to history, the Chalukyas, the dominant rulers of Karnataka state, made Badami their capital and carved these temples. And in 640 AD, Narasingha Varman of Pallava dynasty, conquered the region. By 654 AD, Vikramaditya I of the Chalukya empire defeated the Pallavas and restored it. In later centuries, Badami came under the rule of Kalchuris, Yadavas the Vijayanagara rulers, Marathas and Adil Shahis, the last of whom were responsible for the gates and forts that still stand in and around the town. Badami is surrounded on redsandstone cliffs, with fortified headlands to the north and south. The cave temples carved out of mammoth rocks are located on a scenic hill. The first of these caves is the temple dedicated to Lord Natraja (Dancing Shiva). 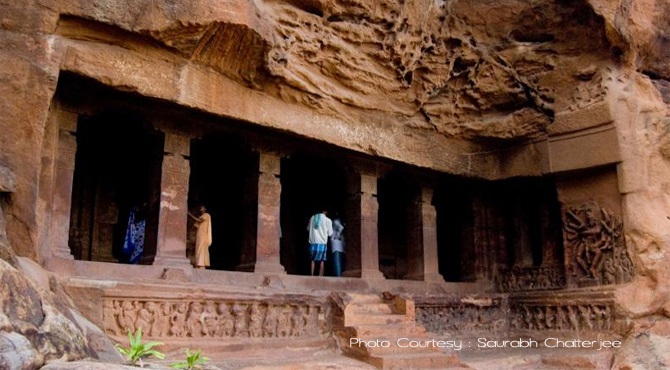 Dated to 578 A.D., it is a rare temple cave temple with a date, which is difficult to find in this part of the country. It is also the oldest among the four caves of Badami. The Cave 2, situated just above the Cave 1 repeats the same features of the Cave 1 temple except that, it is dedicated to Lord Vishnu. Gracefully posed warriors with lotus in their hands guard the porch entrance. The barckets are fashioned as figures emerging from open mouthed makaras. The ceiling panels include a wheel of radiating fish, engravings of Vishnu, Brahma, Shiva and other deities. One of the noteworth painting is that of Lord Krishna, riding a Garnda and the lotus encircled by 16 fishes. Vishnu is shown in his different incarnations on the wall painting. Cave 3 with an opening of nearly 70 feet wide with some exquisite carvings, is the biggest and most attractive of the four caves of Badami. The Cave 3 consists of giant figures of Paravasudeva, Bhuvaraha, Harihara and Narasimha all various avatars of Vishnu. Though the paintings of the ceiling have lost its color, they still retain their beauty. The inscriptions found in the cave indicate that the cave was built by Chalukya Mangalesha. Built, in The Cave 4 was completed nearly 100 years after the completion of the first 3 caves. It is the only cave in Badami dedicated to Jain religion. The major attraction of the cave is the glorious image of Mahavira, the founder of the Jainism situated inside the sanctum. Many Jain Thirthankara images adorn the inner pillars and walls, moreover there are some idols of Bahubali, Yakshas and Yakshis in this cave. As the cave 4 is situated to the east of the other three caves, and also from near the cave we find stone steps leading to the Badami Fort, it would complete the journey if started from Cave 1. Cave 5 is a natural cave of small dimensions with a Buddha statue carved inside. Note : Its better to hire a guide to visit this cave.